School meals served in plastic. The photo above comes from an article I found at CNN.com. The article isn’t about plastics, it’s about the poor quality of foods served in schools. And if you look at all the pictures, there is reason to be disturbed. But I also noticed that all the hot portions are being served in what appears to be either a polystyrene container, or a plastic-lined cardboard container. And stretched across the top of each container, is some cling wrap. The problem with heating, warming or serving food in plastic is that the heat generated increases the migration of chemicals from the plastic to the food. That may not be a big problem for the occasional reheated meal. But if millions of children are being served hot food from plastic containers every single day, that should certainly be a cause for concern. If you prepare school food for your children, and know it will be reheated at school, be sure those containers are made from one of the safer, BPA-free plastics. 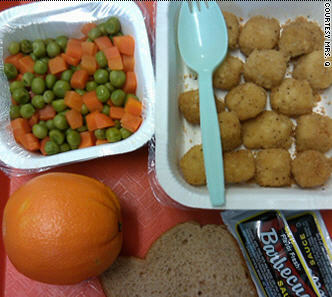 If, however, your children are eating foods prepared by the school, and these are heated and served in plastic, you need to speak with someone at the school, find out the kinds of plastic involved, and get together with other parents to persuade schools to serve lunch portions which are free of contact with toxic plastics.